…who was the first Christian? …and I couldn’t help but think about Mary. Honestly, she would be the first human on earth to be His follower. She was the first one to have a personal encounter with Christ even as He was just an embryo. She not only proclaims the greatness of the Lord and rejoices in God her savior with her words, but also by her very body. She shared her very life with Him in the most intimate way that only a mother and child can. What wondrous love that Mary must have in order to carry the Word Made Flesh…the Word Incarnate…the Lamb of God…the Light of the World…the Son of God…in her very womb. And what loving mother would not continue following her child after birth? We see Mary at every milestone moment of Jesus’ earthly life from conception to death on a cross. Saying “yes!” to God is absolutely a Christian thing. And the most important “yes!” in all of human history is Mary’s “yes!” to conceive the Son of God as announced to her by the archangel, Gabriel. How full of grace she must be so as to bear the Son of God in her very womb! And what expression of Christian joy whenever Mary visited her cousin Elizabeth! So much so that the womb cannot contain John the Baptist’s excitement! And then Mary sings how her soul magnifies the Lord! And…in the most Christian thing she can do… she literally brought Jesus out into the world! The real nativity! …not just a yard fixture or a song about a manger! Angels sing, magi arrive, precious gifts given, and …behold! The King of Kings! The Word Made Flesh!…in a food trough for animals! 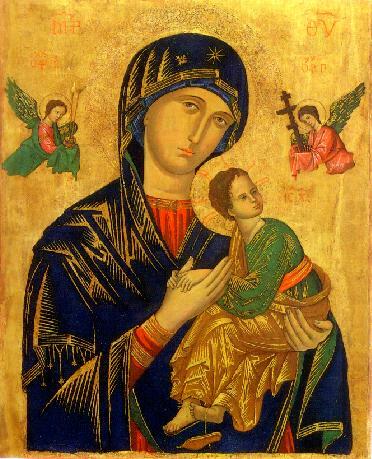 And like any good Christian, she obediently followed the law for her purification after giving birth(though the older, Mosaic one…which her Son now fulfills) by presenting Jesus to the temple when He was an infant. It was there that she learned that her heart will be pierced and that her Son will redeem the world as prophesied by Simeon. And like any good Christian, she found Jesus (as if He needed to be found!). …which is just a lame play on words Christians like. Mary and Joseph kind of left the temple without realizing Jesus wasn’t with them…then they realized it…then they spent a few days looking for him back in Jerusalem. But they ended up finding Him in the temple, talking amongst the older men. He reminds her of His purpose, but obediently follows her back to Nazareth. Like any good Christian, she points others to Jesus. I’m reminded of the scene at the Wedding at Cana when they ran out of booze and Mary pointed to her son. “Do whatever He tells you.” she said. What did Jesus say? He asked the others to go fetch water, which He turned to wine–anditsallbecauseMarypointedthemtowardsJesus. And like any good Christian, she endured the worst knowing that redemption can be had through great suffering. She witnessed Jesus’ Passion until the end at the foot of the cross, with her Son’s blood flowing. Dripping. And Jesus gives His mother to John, the beloved disciple. He gives His mother to us. Sure, these scenes are but a few that Scripture offers in the life of Jesus. And that’s what is great about praying the Rosary–praying with Mary to help me better understand Jesus through her. I cannot think of any human in all of human existence that knows Jesus better than His own mother. As a Christian living ~2000 years later, I can make every attempt at getting to know Jesus as His follower, but nothing I do will come close to Mary. So, I ask for her help. Now, and at the hour of my death.